Harley McShane and her family spend their weekends at the beach kayaking and stand-up paddeboarding. One summer day in 2017, Harley fell in the sand. The next day, Harley still felt sore, so her mom took her to the nearest emergency department. At first, doctors couldn’t find anything wrong with her X-rays and were ready to discharge her, but her mom urged doctors to do a CT scan. 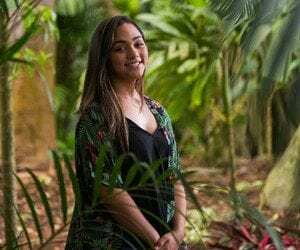 Upon those results, doctors found a hematoma – a blood clot caused by injury to the blood vessel – and transferred Harley by ambulance to Kapiolani Medical Center for Women & Children to see Pediatric Critical Care Specialist Dr. Sidney Johnson. Johnson monitored Harley for a few days to assure she was able to hold down food. Before discharging her from Kapiolani, he expressed to her mom that he was concerned that the hematoma was not caused by Harley falling in the sand but instead was a pre-existing condition. Over time, a hematoma is supposed to shrink, but Harley’s did not. She was diagnosed with a tumor on her pancreas. Harley and her mom followed up with Johnson or an ultrasound, MRI, biopsy and finally, surgery to get the tumor removed. Today, Harley is a healthy 14-year-old and just entered the ninth grade. She plays volleyball, is active in boxing and is part of her church’s club. She continues to take care of herself post-surgery by eating a low-fat diet. Previous post: Countdown to Extra Life Game Day is On!